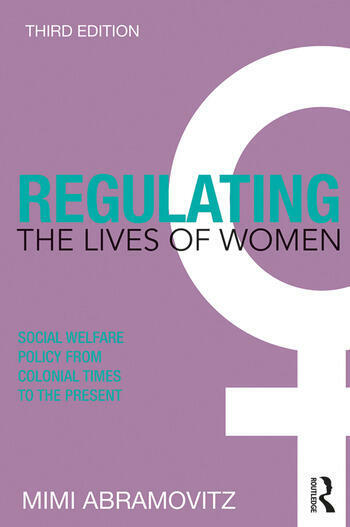 Widely praised as an outstanding contribution to social welfare and feminist scholarship, Regulating the Lives of Women (1988, 1996) was one of the first books to apply a race and gender lens to the U.S. welfare state. The first two editions successfully exposed how myths and stereotypes built into welfare state rules and regulations define women as "deserving" or "undeserving" of aid depending on their race, class, gender, and marital status. Based on considerable new research, the preface to this third edition explains the rise of Neoliberal policies in the mid-1970s, the strategies deployed since then to dismantle the welfare state, and the impact of this sea change on women and the welfare state after 1996. Published upon the twentieth anniversary of "welfare reform," Regulating the Lives of Women offers a timely reminder that public policy continues to punish poor women, especially single mothers-of-color for departing from prescribed wife and mother roles. The book will appeal to undergraduate, graduate, and postgraduate students of social work, sociology, history, public policy, political science, and women, gender, and black studies – as well as today’s researchers and activists. Mimi Abramovitz, the Bertha Capen Reynolds Professor of Social Policy in the Silberman School of Social Work, Hunter College, City University of New York, USA, writes extensively about women, welfare, poverty and activism. From welfare caseworker to welfare rights organizer to welfare state scholar, Abramovitz has galvanized a generation of students explaining how public policy shapes the lives of white women and women of color and how they fight back. "Regulating the Lives of Women is a subtle and nuanced reading of the history of American social welfare policy through a feminist lens. Abramovitz focuses our attention on the ways in which the social welfare system encodes and reinforces the gendered division of labor and established modes of social reproduction, as well as the racialized arrangements of American society. Yet she does not let this be a story of victimization. Instead she defines the welfare state as an arena of political struggle. Her book provides the tools that both progressive policy makers and activists need to inform their struggles for change. It is both insightful and, better yet, useful." "The second edition of Regulating the Lives of Women could not have appeared at a more opportune moment, when women's rights and well-being are under assault in multiple policy areas, on the internet, and in parts of the media. It combines critical analysis with well-researched detail in a coherent and powerful narrative. The book is essential reading, particularly for a younger generation that is unaware that the values shaping today's policies and anti-feminist attitudes have deep historical roots." "Dr. Abramovitz’s work embodies a soul of activism while simultaneously pushing intellectual boundaries with rigor. As a social welfare scholar I have used this book in Harlem, the rural Mountain West, and students in the ivy-league. In each of these dramatically different settings I watched students interact with this text and move from dispassionate policy observers to critical thinkers possessing a keen ability to analyze how our unstated assumptions about women shift and shape the social safety net. At a time when the basic human rights are under political threat this is the type of text students, scholars, and organizers need." "Regulating the Lives of Women is an essential resource. It remains the classic account of how gendered social policies shape the choices poor women make. This new edition is especially important in the face of the end of welfare and new challenges to women’s well-being."